Human chorionic gonadotropin, or hCG, is a hormone that appears in women during pregnancy. It helps guarantee a developing fetus's nutrient supply by unleashing energy stored in excess fat cells in a mother's body, according to the Discovery Health website. Unusually high levels of hCG can indicate any one of several things, including pregnancy abnormalities, mistakes in calculating fetal age and multiple pregnancy, according to the American Pregnancy Association. HCG is produced in the cells of your placenta during pregnancy, according to the American Pregnancy Association. Your doctor can first detect this hormone in blood tests roughly 11 days after pregnancy begins. She can also detect it in your urine in roughly 12 to 14 day after the start of pregnancy. In the vast majority of women, hCG levels double approximately every 48 to 72 hours, until they reach peak levels sometime between the eighth and eleventh week of pregnancy. After this peak, your hCG levels will gradually decrease until you give birth. Your doctor can detect hCG with two blood testing procedures, the American Pregnancy Association notes. In qualitative testing, she will merely look for any sign of hCG in your bloodstream. In quantitative testing, she will measure precise amounts of hCG in your blood to monitor your pregnancy and look for signs of potential problems. In most cases, your doctor will not diagnose potential problems on the basis of a single hCG test. Rather, she will perform multiple tests, with an interval of roughly two days between procedures. In some cases, apparently high levels in hCG testing may result from a simple miscalculation of your baby's gestational age, the American Pregnancy Association explains. Since hCG values can vary significantly between individuals, your doctor will not typically base hisinitial gestational calculations on hCG alone. However, he may make a mistake even when other forms of pregnancy confirmation are used. In some circumstances, the heightened hCG output of multiple fetuses can also produce elevations during hCG testing. You may also produce abnormally high levels of hCG if you have a rare type of growth or mass in your uterus called a hydatidiform mole, according to the American Pregnancy Association and the U.S. National Library of Medicine's MedlinePlus. This type of mole forms when tissue that should form part of your placenta develops in excessive amounts. In some cases, you may develop a partial molar pregnancy, which results in some degree of fetal development and an atypical placenta. In other cases, you may develop a full molar pregnancy, which is characterized by an atypical placenta and complete absence of a fetus. 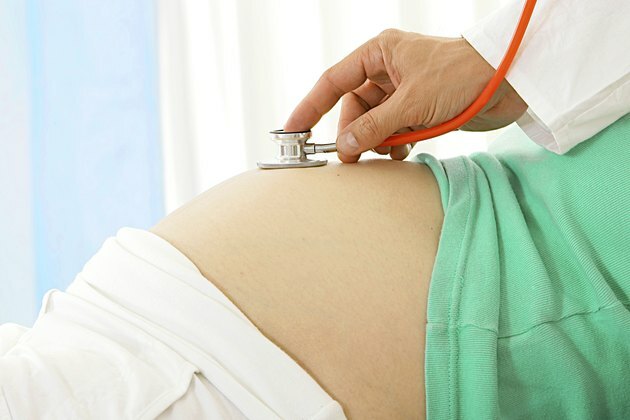 MedlinePlus lists symptoms of a molar pregnancy that include vaginal bleeding during your first three months of pregnancy; severe nausea and vomiting; abnormally excessive or low growth of your uterus; and symptoms of abnormally high thyroid function such as rapid heartbeat, restlessness and heat intolerance. Your doctor may recommend a suction curettage procedure to end a molar pregnancy. If this occurs, avoid getting pregnant again for at least six months. What Causes Raised HCG Levels?